Spray 5- to 6-quart oval slow cooker with cooking spray. In 10-inch nonstick skillet, cook pork over medium-high heat 5 to 7 minutes, stirring frequently, until no longer pink; drain. Stir in taco seasoning mix and water. Cook over medium heat 1 minute, stirring constantly to coat. 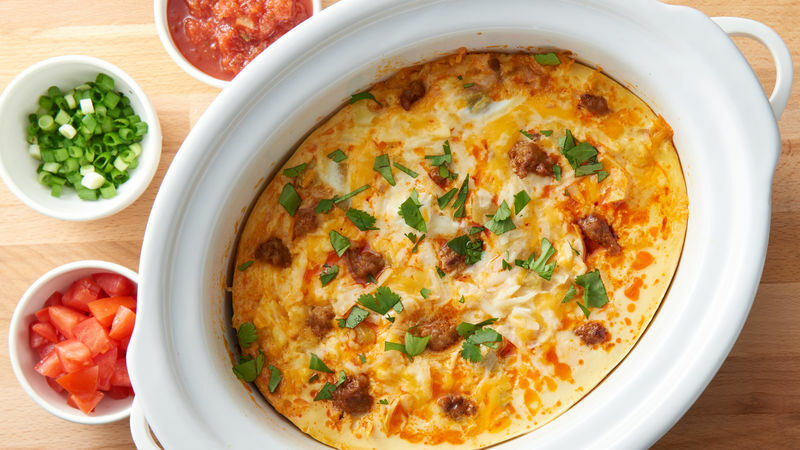 In large bowl, beat eggs and half-and-half with whisk. Stir in green chiles, shredded cheeses, hash brown potatoes and seasoned cooked pork. 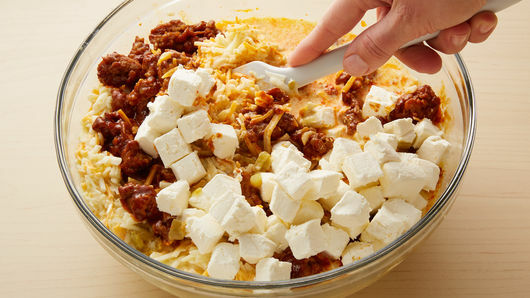 Carefully stir in cream cheese cubes. Transfer mixture to slow cooker. Cook on High heat setting 3 to 3 1/2 hours, rotating insert after 1 1/2 hours. Cook until casserole is set and temperature in center is 165°F. Top with remaining ingredients. Take it up a notch by adding 1/4 teaspoon ground red pepper (cayenne) to the taco seasoning mix. Serve with freshly diced jalapeño chiles for additional spicy heat. 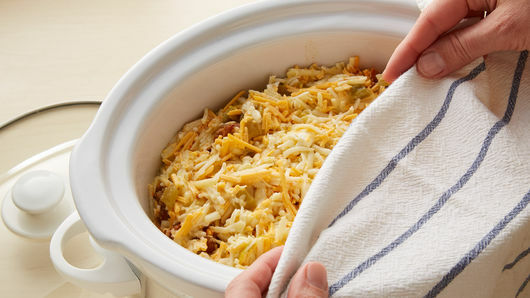 Rotating your slow cooker insert halfway through cook time helps prevent casserole from getting too brown around edges.